For many years, punishment-based training techniques have been the go-to method for training dogs, based on a misconception that dogs are hierarchical, pack-based animals that have evolved to use aggression to become either the “Alpha” of the pack or accept a more submissive role within the group. As such, pet owners have mistakenly believed that they must assert their dominance in an aggressive and confrontational fashion to effectively train their dog. 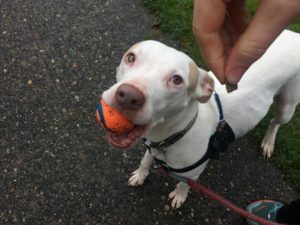 Wesley Hawkins, our owner and head certified trainer, recently debunked this myth on the Puget Sound Puppers blog, but what alternative techniques can you employ? Positive reinforcement is the answer. This approach centers around the reinforcement of desired behavior with positive incentives such as praise or treats. This means that pet owners don’t use aversive methods (i.e., causing discomfort) to punish their dog when they exhibit unwanted behavior, instead they praise them when they do the right things. This type of training conditions and shapes their behavior without aversion and increases the likelihood of them repeating the desired action or behavior. A dog’s growth mindset is quite similar to ours – they thrive on encouragement, reward, and praise. Hearing that we’re doing a good job motivates us much more than if we are only getting punished for errors or never getting praised for a job well done. The same is true for dogs. When you provide them with praise, it reinforces desired behaviors and boosts their confidence. These techniques use non-confrontational methods to stimulate and shape your dog’s behavior in a rewarding way, thereby establishing routines and actions that are incompatible with negative behavior and lessening a dog’s frustration and confusion. Most importantly, the dog can trust in the owner, without fear of aversive treatment or punishment. What are the benefits? When a dog fully trusts their owner, they can enjoy a relationship with mutual trust, affection, and cooperation. Their interactions become more predictable and comfortable; this will allow the dog to be more tolerant and self-controlled. As a result, they will have no need to display anxiety-based behaviors (e.g., growling, biting, avoidance). Because of these potential benefits, the Puget Sound Puppers family passionately believes that positive reinforcement training is the only type of training that should be used when interacting with your furry loved ones. Not only is it endorsed by the AHA, HSUS, SPCA, ASPCA, and most Schools of Veterinary Medicine, but it also recognizes that dogs deserve respect and understanding as sentient beings with their own emotions and choices. We therefore require that all of our walkers and trainers are extensively trained in those methods, and we provide opportunities for continued education in concepts related to non-aversive training and dog handling. If you’re interested in learning some positive reinforcement techniques yourself and enhance the bond you have with you dog(s), feel free to reach out to us!